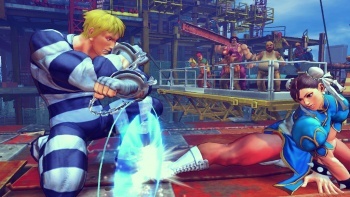 A gamer has set the world record for the longest winning streak in Street Fighter IV, but does this mean anything? A GameStation store located in the city of Hull, UK was the site where European Street Fighter IV champion Ryan Hart set the world record for the longest winning streak ever in Street Fighter IV this past Saturday, according to the Guinness Book of World Records. In four hours, Hart took on 169 of Hull's best challengers and defeated every single one of them, some quite embarrassingly. The previous record was held for a meager 108 wins. One player was taken out in seven seconds, says Guinness' press release, which makes me think that Hart was playing single-round matches. Traditionally, Street Fighter has been played in three-round matches, so I already have a personal problem with this record. With the average survival time only 12 seconds, this also makes me think that a bunch of noobs lined up to take Hart on, seeming to additionally mar this world record. Then again, Hart is the champion of a continent, so I'm not sure even my seasoned dragon-punching skills would have lasted more than a fifth of a minute either. Still, this world record announcement highlights the trouble with the Guinness Book of World Records even having its relatively new gamer's edition at all. What types of records deserve to make it into this book? Does every single version of Street Fighter get a printed winning streak record? Can I submit my record for the most profanities spelled using hay bales in Farmville? Maybe all world records have the same problem, and perhaps they're just meant to be part of a fun book to look at. Still, if a group wants to say that someone has set the world record on something, I feel like it should be something that matters. Every person that Hart beat should have a minimum level of experience with the game. There should be requirements, otherwise the record is meaningless. The world record for oldest person in the world or the world's largest PokÃ©mon collection are more quantifiable, and these kinds of records make more sense to me. The world record for most matches won in Street Fighter playing as Dhalsim using only punches seems more on shaky ground due to the quality of the competition required. If Guinness has these requirements, I apologize, but when we get into achievements in particular games being called world records, it seems like those could go on forever and ever without really being anything at all.